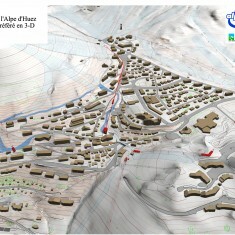 Alpe D’Huez | Alpe D’Huez | Ecosign Mountain Resort Planners Ltd.
Ecosign and two other firms were selected by the Commune d’Huez en Oisans to develop concepts to improve access and circulation between the villages that make up the Alpe d’Huez Ski Station. 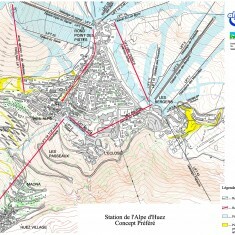 We prepared a detailed technical analysis of the Village of Alpe d’Huez and the surrounding slopes. 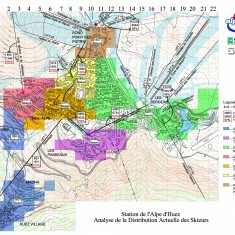 With the assistance of the town’s planning department we completed existing and future accommodation density analyses to graphically portray the relationship between the accommodation centres and the ski area staging lifts. Using peak day lift ride and transit counts, we were able to determine how people move around the resort during peak occupancy periods and identify where the bottlenecks were. We then evaluated a number of technologies (aerial lift, bus and funicular systems) for each of the routes. The second phase of the study took the feasibility analysis to a greater level of detail, establishing alignments, defining the stations and working with the lift manufacturers to develop profiles, capital costs and operating requirements. 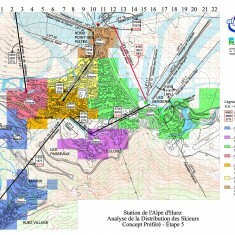 Through an iterative process, we worked with the client to develop a 5 stage plan for transportation improvements in the Alpe d’Huez Village and between Alpe d’Huez and Bourg d’Oisans. A key element of the preferred concept was an 835 m funicular with a capacity of 3,150 pph in either direction.